27 years old, passion for European art-house cinema, Starcraft II player, Chairman of Filmtheater de Uitkijk, Studying MA New Media @ UvA, love travelling in Asia, interested in open source data, concerned about the future of cinema in a new digital world, dislike populists in the Netherlands. When I visited Jakarta a couple of years ago I was astound by the number of mobile phones that everybody used. My aunt actually owns five different phones that all are used on a daily basis. My family has been living in Jakarta for more than forty years and they witnessed Jakarta growing into the capital city of a modern nation. What Jakarta sets apart from other cities in Indonesia is the fact that Jakarta is a city with an urban culture that is an enormous mix of different cultures. Back to the mobile phone, when I walked around the city I went into a little Warung (shop) and asked the salesman for some phone credit. I was able to choose from more than twenty different providers and saw how all these provider were aiming for different customers. One of the providers aimed for a younger audience while other providers aimed for seniors, workmen or even pregnant women. But all the providers had one thing in common, they all wanted to increase the cultural status of their customers, by showing them a utopian image of wealth and status. When I first saw Michiel de Lange’s book: Moving Circles; mobile media and playful identities I was immediately interested because I recognized the phenomenon and the way it plays with people’s identity. 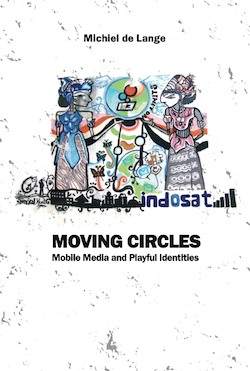 In Moving circles mobile media and playful identities cultural anthropologist Michiel de Lange investigates the mobile phone and how it becomes part of our everyday life with astonishing speed, especially in countries like Indonesia. The writer wants to know what impact this phenomenon has on the identity of people, because we always need an external medium to understand our own identity in this way our identity is always mediated. The new ways of using mobile media creates a new form of identity mediation through the notion of play. De Lange uses four levels of play in an easy to read way, to help the reader better understand the influence of mobile telecommunication. These four levels consist out of: play on new media, play with new media, play through new media and played by new media. These forms of using new media tools create a playful interaction with new media forms like mobile phones; this process eventually influences our identity. Our identity shifts to a conditional “game” where technology and identity play with each other in a certain space and create new structures, borders and obligations. To illustrate this “space” De Lange uses the capital of Indonesia, where 23 million people live and mobile communication the single most important daily occupation is. After the dictator Soeharto was removed from office, a big surge in the use of Internet and mobile communication started to show. The reason of this growth is partly due to the fact that during the reign of Soeharto there was no real communication network for the citizens of Jakarta, and so when mobile phones were available everybody wanted one. De Lange uses three different citizens to show that mobility is of great importance. These people all illustrate the three most important aspects of mobile phone use: physical, socio-economic and imaginary mobility. 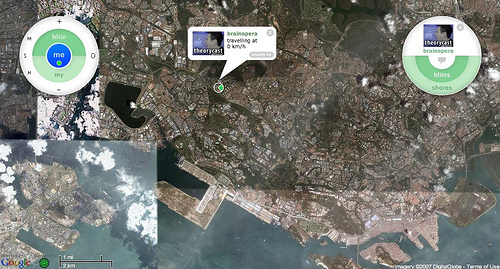 The question arises why the city (Jakarta) is such a good object to study technologically mediated identities? De Lange’s reason for using the city is very simple and consists out of three important parts. 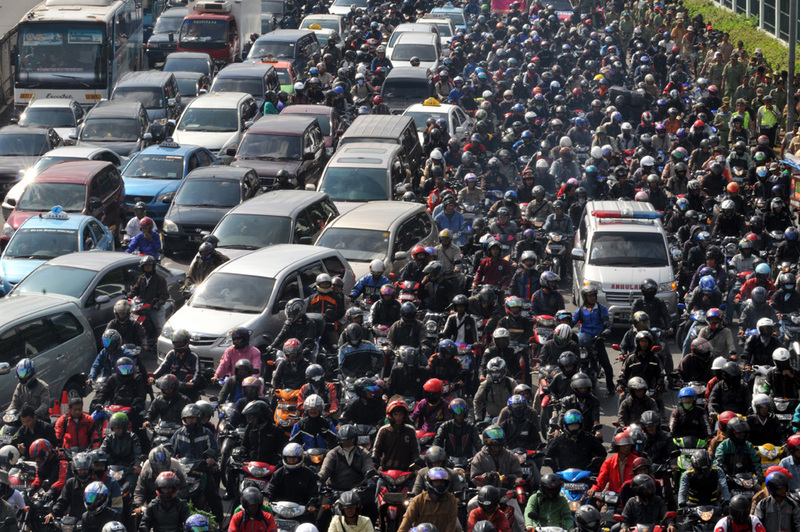 First the fact that worldwide the cities house over half the world’s population, in a city like Jakarta there are many workers that move to the city. The migrant workforce is an interesting object because they have a dual identity: that of city-dwellers and migrants. The migrants constantly interact with both the city and the rest of the country making them more valuable object to observe. The most important part is the city’s heterogeneous social makeup. This social makeup makes people actually aware of the their differences as individuals and groups, creating their unique identities. De Lange uses a form of locative media called Bliin to perfectly illustrate how these unique identities interact and share their similarities within the city. But what are locative media? Locative media are forms of media that consist out of mobile devices, wireless networks and different forms of global positioning hardware like GPS. Bliin is a good example and works exceptionally well in Jakarta. Bliin is a locative media platform that allows users to share their geographical location, movements, and their personal experiences of places and travels online. Users need a phone capable of receiving GPS signals. They install an application on their device that automatically sends GPS positioning coordinates to the Bliin server in real time over a wireless data connection. Bliin’s interface is a map of the surrounding where everybody within the network is shown. People can interact send pictures and tag different kinds of content like a photo of a good restaurant. De Lange argues that these forms of locative media like Bliin are actually forms of pervasive gaming. Pervasive gaming is not the only “game” element analysed by De Lange. He also categorizes four different groups. First users use the mobile phone to differentiate themselves from the crowd and even hack the mobile phone to do this. Secondly the mobile phone creates unexpected moments in everyday life. Thirdly the mobile phone is a form of self-representation. Finally the mobile phone constantly creates impulses that stimulate the senses. All these four “game” elements create what De Lange calls: circles of little gifts. Mobile media influences these circles and the circles influence the mobile media. This book is Michiel de Lange’s dissertation; it combines the notion of play and locative media in an easy to read and interesting book. The book uses the not often used city of Jakarta to illustrate de growing number of people that use new media in their everyday life. Indonesia is one of the growing powers in Asia and has one of the biggest growing population using Facebook and forms of locative media. While focusing on the combination of media studies and urban culture in Indonesia this book creates a new perspective in identity mediation influenced by the rise of these new mobile technologies. If you want to know more about Michiel de Lange and his studies of mobile media and urbanism check out his Twitter and Blog. There is also a very intresting video with Mary McDowell, Chief Development Officer at Nokia, at The Economist’s “Innovation: Fresh Thinking for the Ideas Economy” event in Berkeley, CA. In this video Mary talks about the future of mobile devices, use of the built-in sensors and information access in the developing world like Indonesia. Nice review! I’m reminded me contrastingly of the documentary “Catfish” and the definitively less playful identities mobile phones can facilitate.